The contrast between Wall Street’s continuity government in Washington under another Clinton in the White House and the charismatic populist voice of Senator Elizabeth Warren as she stumps for Democrats in the midterms, is awakening millions of Americans to the idea that there may be choices after all in the 2016 presidential election. What Robinson really means is “a message of hope” – that Wall Street’s wealth transfer system, institutionalized under a protection racket by members of Congress who keep their seats using Wall Street’s campaign dough, could come under serious challenge with Warren in the White House. Where would such an idea come from? The Center for Responsive Politics reports that four of the top six donors to Hillary’s failed bid to capture the Democratic nod for the Presidency in 2008 were employees, family members or PACs of major Wall Street firms: JPMorgan Chase, Goldman Sachs, Citigroup and Morgan Stanley. The idea that Wall Street is running a continuity government in Washington stems from the fact that it was President Bill Clinton who repealed the Glass-Steagall Act, a goal Wall Street and its legions of lobbyists had advanced for decades. This breathtaking deregulation of Wall Street did not happen under a Republican presidency but under one styling itself as progressive. The repeal allowed commercial banks holding insured deposits to merge with investment banks, brokerage firms and insurance companies to become vast gambling casinos, looters of the little guy, and to crash the economy in 1929 style fashion just nine years after Clinton signed the repeal legislation in 1999. The Wall Street sycophants in the Bill Clinton administration who pushed through the repeal of this legislation that had protected the country for seven decades included Treasury Secretary, Robert Rubin, and the man who would step into the Treasury post, Lawrence Summers, after Rubin headed for Citigroup to collect $120 million in compensation over the next eight years. Both men turned up as advisors to Obama once he took his seat in the Oval Office. Last year, Obama attempted to push through the nomination of Summers, then on the payroll of Citigroup as a consultant, to become the Chairman of the Federal Reserve Board of Governors. It took heavy backlash from members of his own party to advance Janet Yellen’s nomination over Summers. Senator Warren: “Now, I’m concerned that the mega banks not only have the capacity to tilt the financial system, but that they also have the capacity to tilt the political system. You know, we’ve learned that as big banks get bigger and bigger their lobbying power and influence in Washington also tend to grow. That means big banks can often delay, water down or even kill important regulations. So, size can have ripple effects everywhere and for that reason I think it’s a mistake to talk about size without considering how it affects the ability of government to enforce meaningful regulation. Fischer responded that he wasn’t convinced that banking supermarkets actually achieve any economies of scale. Fischer said he thought his Citigroup experience would help him at the Fed. 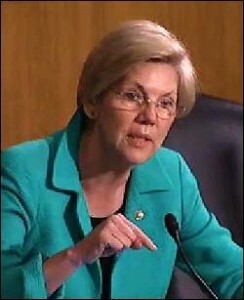 Senator Warren has just defined Wall Street’s continuity government in Washington. That makes her dangerous to the status quo on Wall Street and a desperately needed voice of change in the Oval Office.